I have mixed feelings about three of these. Â Bright green is definitely out; it screams for attention and overpowers the rest of the piece. Â Of the remaining ones, I like the dark green and burgundy very slightly more than the purple – I think in the end it really depends what effect I’m after. Plans for today include testing several chocolate flavor combinations, working on pattern drafting and muslins, overdyeing the woven panels, and catching up on my work as Publicity Chair for Complex Weavers. 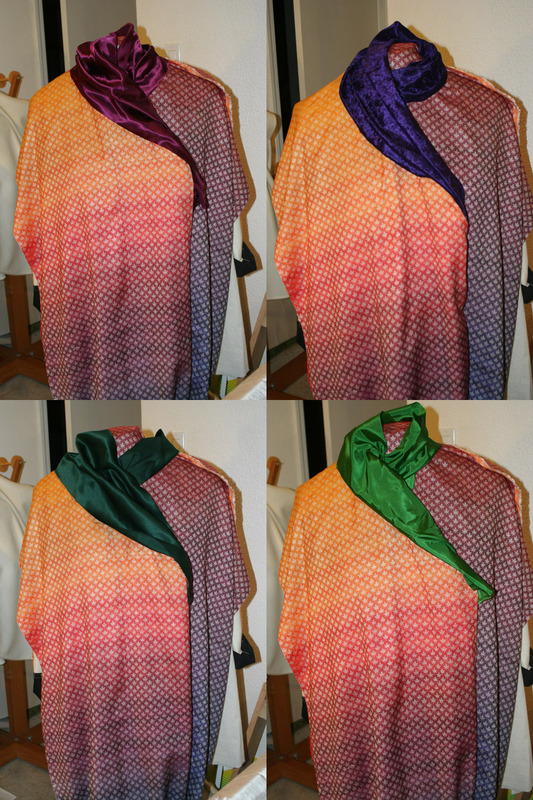 Â I’ve decided that weaving the final two dark panels can wait until later – it’s not essential to my current goal, which is to have the muslins and one sample panel in each fabric ready to show Sharon next Sunday. Upper left, definitely. The others are too different from the garment body to look like they were meant to go together, while the burgundy looks related. can’t wait to see what happens with the overdyeing!